British Olympic Association chief executive Andy Hunt says this summer's Olympics will be the "Twitter Games". Hunt told Radio 5 live Breakfast they are in favour of athletes using the social media forum, although there would be instructions issued. "We want athletes to embrace all aspects of media, including social media," he said. "Provided people think very carefully about what they say, it is a great way to engage with the British public." He added: "For some athletes, there will be very clear rules around when they tweet before, during and after competition. "The International Olympic Committee themselves are really pushing the use of social media and we support that. "There are going to be some real clear guidelines about what to say and what not to say." Many sports stars regularly air their views on a wide range of topics on Twitter, with the latest big name to use it in a high-profile incident being QPR midfielder Joey Barton. He was sent off in a Premier League match against Norwich on Monday and used his page to criticise the decision, saying: "Feel for the officials, they've been conned." 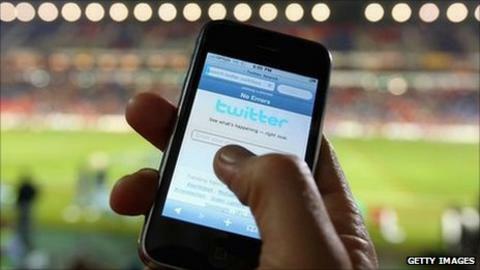 BOA chief says he is in favour of athletes using Twitter. And snooker star Mark Williams is facing a World Professional Billiards and Snooker Association disciplinary after being accused of using offensive language on Twitter. Last summer, British triple jumper Phillips Idowu upset UK Athletics head Charles van Commenee when he revealed on Twitter that he was pulling out of the European Team Championships. At the time, van Commenee said: "These things are done personally, there are certain channels you have to follow." And the BOA's stance differs from that of the English Football Association and New Zealand rugby board who banned their players from using social media during last year's football and rugby union World Cups. It is also opposite to that of Olympics organisers Locog, who have issued rules to their 70,000 Games Maker volunteers banning them from speaking about any aspect of their roles on social media during the Games. Meanwhile Hunt told BBC Radio 4's Today programme he believed the BOA's by-law banning drug cheats from the Olympics for life had benefited British competitors at past Games. The World Anti-Doping Agency has said the BOA rule is "non-compliant" and the BOA is taking the case to the Court of Arbitration for Sport (CAS) in a bid to keep the ban. Hunt said: "We have gone from 36th in the medals table in 1992 to fourth in Beijing which is a most extraordinary meteoric rise in performance and no-one in the world has any suspicion that British athletes are not clean. "I'm pleased we are fighting the cause for clean competition, that's the important point. "We will know either way via CAS whether our selection policy is going to stand and we think it's really important for every national Olympic committee around the world to have the right to select athletes on the basis which they determine."